Karin Beier’s new production of Jean-Paul Sartre’s adaptation of Euripides’s tragedy is about as unlike Chris Haydon’s production at the Gate as it’s possible to be. It’s playing in Schauspiel Köln’s *other* temporary home, in EXPO XXI – I think generally an exhibition centre. And possibly my new favourite theatre space (see below). The theatre itself is essentially a vast hall where they’ve set up some raked seats in one half – maybe as many as the Lyttleton Stalls, give-or-take – and the other half is the stage. Here, the (large) stage is demarcated, framed by one of those aluminium truss frames for lighting (although most of the lights are hung from the ceiling or at the sides of the stage), and on the ground by a thick field of soil. At the rear of the set is a cellist, a percussionist, and a drummer (all female) and behind them, some metres back, the unadorned back wall of the Expo hall, which handily has one of those shuttered metal doors which roll up into the ceiling. (Unless they’ve built that whole back wall, in which case, German theatre really does have more money than sense). Onto this set steps Poseidon (Robert Dölle), wearing a ridiculous Greek Gods style wig, beard and tunic/toga. 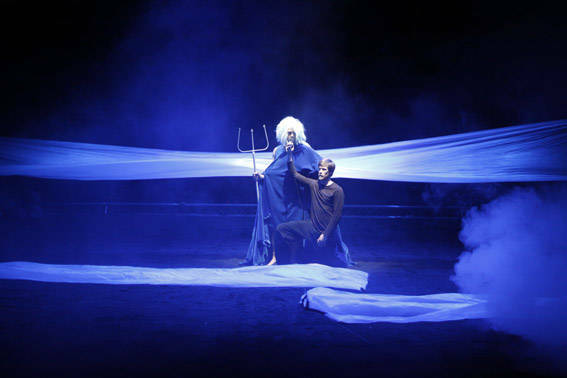 He stands in an ocean made of – I kid you not – six actors flapping three blue sheets á la school play oceans, and holds a particularly flimsy looking trident. He alone – no Athené in Sartre’s version – introduces the argument, then strips off his costume, and walks in vest and a pants to the front of the stage, microphone still in hand. Then the women arrive. Dressed anonymously at first, huddled in large quilted blankets, like unzipped sleeping bags, over t-shirt material dresses. Modern dress, again, but more like the costumes of Mitchell’s 2007 NT production than the emergency room fatigues of Haydon’s Gate production, but dressed-down: rehearsal room, own-clothes versions of the Mitchell costumes. The lights are low and largely horizontal. One woman runs round this muddy field with a hand-held smoke machine to create the fog. 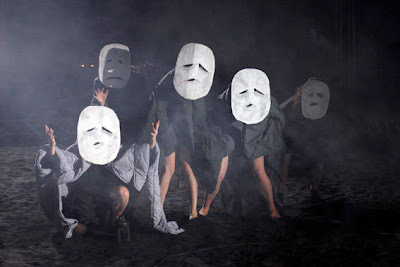 The women put on giant cardboard, makeshift tragedy-face, chorus masks. An opening speech is made, in beautiful, lyrical German. The woman’s voice, low and level, speaking into a microphone. The women separate, differentiate. Hekuba becomes obvious – played by Julia Wieninger (last seen as the female lead in Katie Mitchell’s Riese Durch die Nacht here). The play begins to unfold pretty much as per the course of the plot in Euripides. Sartre’s adaptation (1964) is apparently pretty faithful to the original, only adding in some anachronistic references to Europe and Asia to decry modern colonialism. (and has much more, therefore, to do with, say France in Algeria, than WWII, which I had wondered about, bearing in mind the anti-Nazi uses that other classics had been put to – notably Camus’s Caligula and Anouilh’s Antigone). It occurred to me in passing that this was the first time I’d seen Trojan Women in a country that had lost a war, not only within living memory, but on its own soil. That this wasn’t *just* an exercise in empathy tourism, but also a part of the national experience. There are also textual interventions. One from Beckett’s Texts for Nothing – which at a guess, would be the part where the women are suddenly ordered to move a pile of demonstrably heavy sacks from the back left of the stage to downstage right, by the voice of Talthybios (Nikolaus Benda) issuing from a large, oversized megaphone speaker that hangs over the muddy beach. Texts by Bataille, Goethe, Nietzsche and Pasolini are also used. 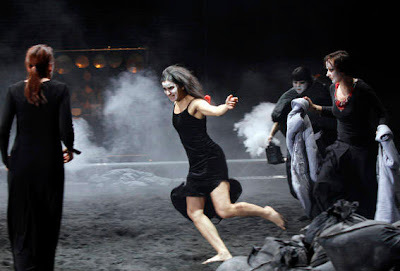 The scene with Kassandra (Rosalba Torres Guerrero) is played almost as a direct hommage to Pina Bausch’s The Rite of Spring. Indeed, the combination of the soil-covered stage, her the tattered dress, and the very specific dance moves – here accompanied by rhythmic panting, drums, percussion and jerky cello figures – does seem deliberately evocative. Elsewhere the style is more Forced Entertainment, the cardboard masks, the “own-clothes” school of modern dress, the direct audience address, the sometimes lack of being “in character”. Beier also makes use of a kind of choric sing-speaking, which is gorgeous, haunting, powerful, and unlike anything I’ve ever seen/heard before – although there are echoes of it in the only other Karin Beier production I’ve seen – her production of the three Jelinek pieces Das Werk/ Im Bus/ Ein Sturz. At another point there is a staggering coup – at the point where Andromache’s baby is taken 50 or so members of a German/Korean choir stand silently at the back of the auditorium and deliver a vast choric chant (in Korean, I think). It is incredibly powerful. Apparently there’s something similar in Michael Thalheimer’s Orestia at Deutsches Theater, but I’ve not seen that, so this was also something of a revelation. The way the whole thing unfolds is an absolutely joy to watch. It’s intelligent, satisfyingly arty and, I think, still moving – although my mental jury is still under-informed as to whether this production was *meant* to be more Brechtian; so we don’t get sucked into “feeling” for the characters; or a bit more post- something than that. (I think there’s an interesting division between understanding national theatrical intentions, and how we watch theatre still it according to our own national traditions – highlighted, perhaps unintentionally, in this excellent, exciting blog about Berlin theatre by the Never Properly Born theatre company) There’s an essay by Lehmann on tragedy in the programme. But there are also essays by Habermas and Arendt, and a report by the US State Department on people trafficking. It’s a seriously intelligent programme. Annoyingly it is all written in German, but I can’t have everything. There is a simple, brilliant fluidity to the work. And an constant inventiveness. Essentially, no two bits of the play are presented in the same style, but, thanks perhaps to the coherence of the design, and of the overall dramaturgy, it never feels contradictory, or as if the flow of the thing has been “broken”. There is never a false move. Or perhaps, once, where the actress playing Andromache, Lina Beckmann, does proper full-on emotional acting, with real tears, when her baby is taken. (The baby is played by a shirt tied around one of the sacks. It’s strangely, compellingly convincing.) But, in amidst all the intelligence and commentary, the moments of genuine emotion also worked well – doubtless better still if one knew *exactly* what they were saying, rather having than a reasonable idea. The German reviews of the show – especially local ones – spend much of their wordcount noting that this show also effectively marks the end of Karin Beier’s time as Artistic Director of Schauspiel Köln; she moves to Deutsches Schauspielhaus Hamburg for the ‘13/‘14 season. Obviously – apart from the Theatertreffen selection – this is a party to which I arrived too late to comment, but what is notably observable here is a really strong sense of a “feminist” aesthetic or sensibility. It’s not just that there are far more women than men on the stage, or that a notably high proportion of the creative team are women – although that doesn’t hurt – it’s something more intrinsic than that. Perhaps it’s just knowing this was directed by a woman, but it feels more thoroughgoing; as if this production really couldn’t have been created by a man. Like it’s viewpoint was somehow different. This is something I would also like to explore further.